On a recent Saturday morning I happened upon on a farmers' market that I had not been to before. I'm very lucky that in my general area there are multiple markets on every day of the week. My biggest complaint about the markets closest to me is that they never seem to have any protein. I can load up on produce or bread, but when it comes to my other staples, I always end up at the grocery store on my way home. I was thrilled when, walking through this new market, I discovered eggs, cage-free chickens, grass-fed beef and even locally harvested shellfish. I was in heaven. My first instinct was to immediately move so I could be within walking distance of my new favorite market, but after taking a moment to calm down, I set about getting the week's supplies. My biggest sin at the market is buying something because I'm taken in by how great it looked or how fresh it was, but with no plan on how actually to use it. I either end up not using it or having to go back to the store to buy everything else I need to make whatever it is I have decided to create with said fresh item. This go around it was two pounds of short ribs. Having happened upon the market with so much protein, I just couldn't leave without getting some. Shopping at the new farmers' market got me thinking more about locally grown food. I always prefer to buy my produce at farmers' markets because I absolutely agree with trying to use locally grown and produced food whenever possible, but I never really took it beyond produce. This market opened up the idea that I could do more than just get local produce. With that in mind, I set about creating a new short rib recipe using only locally grown or produced food in the recipe. Finding local produce was easy. I didn't have to look further than my local farmers' markets. The first place I ran into some trouble was with locating locally produced tomato paste. It quickly became clear that I would have to make my own. After browsing the internet for some time, I found this method that turns 5 pounds of tomatoes into about a 1/2 cup of paste. It certainly isn't the economical way (with time or money) to get tomato paste, but the flavor was absolutely better and, it was from locally grown ingredients. Problem solved. Check back in a few days to see the stock I made to use as a braising liquid. Chop the tomatoes. Uniformity is not important as the tomatoes will be passed through a food mill shortly. 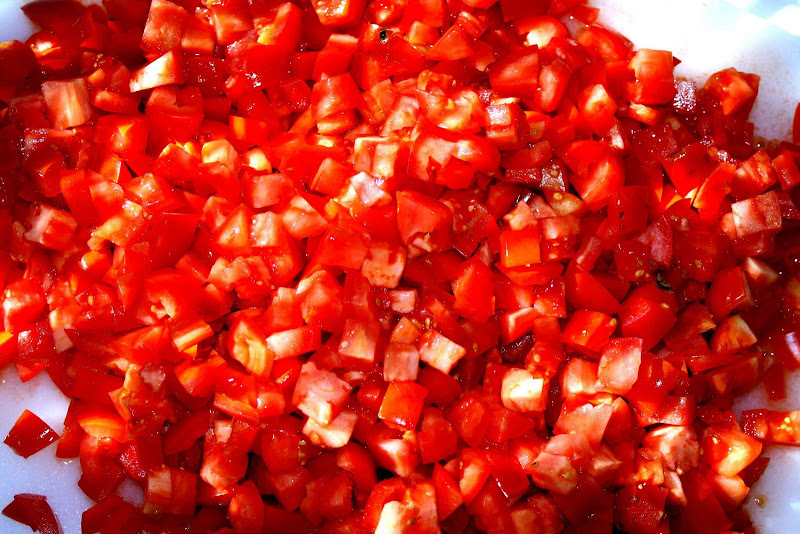 Heat the olive oil in a large saute pan and add the chopped tomatoes. Simmer for 4 - 5 minutes until the tomatoes are releasing their juices. Pass the tomatoes through a food mill fitted with the smallest disc. 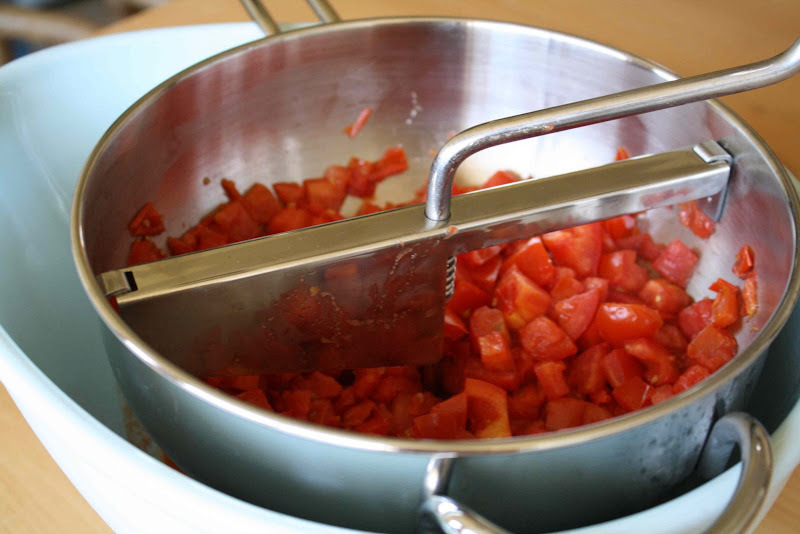 If necessary, take the tomato pulp still in the bowl of the food mill and return it to the saute pan to help it break down some more and release its juices. Once all the tomatoes have been processed, place the tomato liquid in a half-sheet pan (rimmed cookie sheet) and place in the oven for four hours. stir the mixture every hour until a tomato paste texture has been achieved. If storing in the fridge, pour olive oil into the container to cover the paste for storage. Enjoy! I am jealous- I wish we had more local markets like you! Glad you found another that you really like. Great recipe! You are amazing. Amazing. I don't think my grandmother (who is the original Martha Stewart) would even attempt her own tomato paste. I'll keep sitting here and dream about your tomato paste, or the tomato paste that I am not currently making but should! I am so impressed! It looks great! Wow that's a lot of tomatoes for such little paste, but I bet the flavor was delicious. Wow, you even make your own tomato paste! Nice work! I am sure it is way better than the store bought stuff! I bet it does taste amazing! It's never even occurred to me to make tomato paste from scratch :), I bet it's so much healthier too! It has such a beautiful color! Goodness that looks amazing. Who knew tomato paste could be so drool inducing? Now this is impressive. 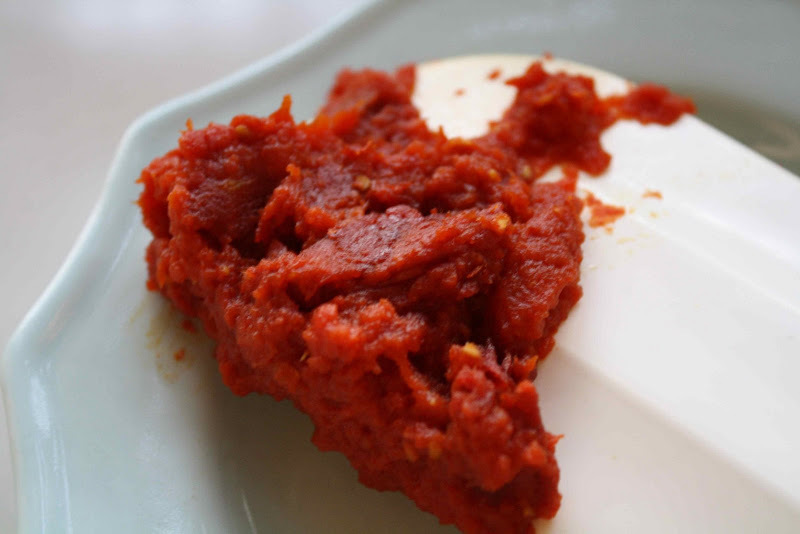 I never would have thought about making tomato paste from scratch! Great idea. There is an award waiting for you over on my blog! What a beautiful color and good on you for using local foods. Yum! I love finding things that I can make from scratch. Makes the whole meal taste better. Probably the extra dose of love. I really like your blog. I stumbled onto it from another site somewhere. I have a blog that I would like to share with you, too. i found your blog after seeing the "well fed" awards. congrats! it was an instant bookmark - your blog is fabulous! after reading what appeared in the mainframe, i also checked out the homemade tomato paste post. i was JUST thinking on monday about how much i would so much rather make my own tomato paste. what perfect blog timing! My husband is growing so many tomatoes this year this sounds like a great use for some of them. I bet it freezes well? I'll try it, freezing in an ice cube tray then transferring to a freezer bag. Love this recipe. Thanks for posting it. I have wanted to know how to do this for a while now, and...well now I do. Thanks again.